CRISPR-Cas12a (formerly Cpf1) is an RNA-guided endonuclease with distinct features that have expanded genome editing capabilities. Cas12a-mediated genome editing is temperature sensitive in plants, but a lack of a comprehensive understanding on Cas12a temperature sensitivity in plant cells has hampered effective application of Cas12a nucleases in plant genome editing. We compared AsCas12a, FnCas12a, and LbCas12a for their editing efficiencies and non-homologous end joining (NHEJ) repair profiles at four different temperatures in rice. We found that AsCas12a is more sensitive to temperature and that it requires a temperature of over 28 °C for high activity. 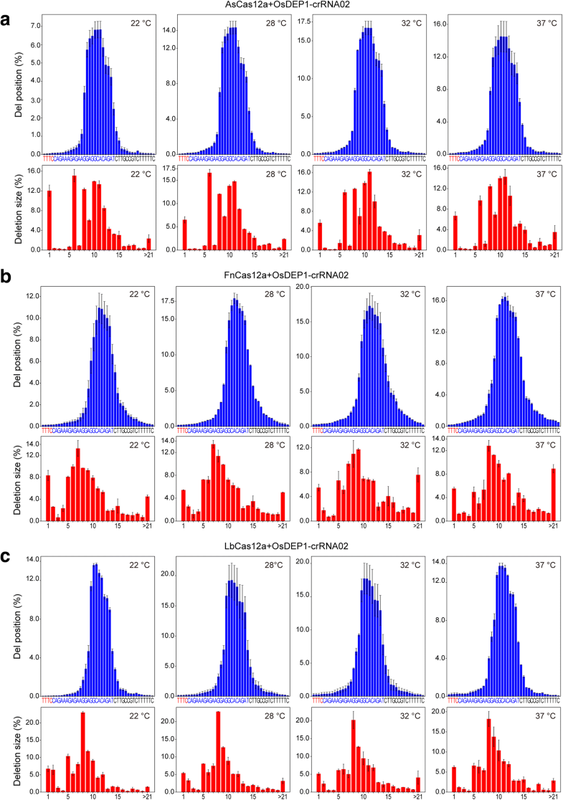 Each Cas12a nuclease exhibited distinct indel mutation profiles which were not affected by temperatures. For the first time, we successfully applied AsCas12a for generating rice mutants with high frequencies up to 93% among T0 lines. We next pursued editing in the dicot model plant Arabidopsis, for which Cas12a-based genome editing has not been previously demonstrated. While LbCas12a barely showed any editing activity at 22 °C, its editing activity was rescued by growing the transgenic plants at 29 °C. With an early high-temperature treatment regime, we successfully achieved germline editing at the two target genes, GL2 and TT4, in Arabidopsis transgenic lines. We then used high-temperature treatment to improve Cas12a-mediated genome editing in maize. By growing LbCas12a T0 maize lines at 28 °C, we obtained Cas12a-edited mutants at frequencies up to 100% in the T1 generation. Finally, we demonstrated DNA binding of Cas12a was not abolished at lower temperatures by using a dCas12a-SRDX-based transcriptional repression system in Arabidopsis. Our study demonstrates the use of high-temperature regimes to achieve high editing efficiencies with Cas12a systems in rice, Arabidopsis, and maize and sheds light on the mechanism of temperature sensitivity for Cas12a in plants. Many genome editing outcomes are achieved through sequence-specific nucleases (SSNs) which generate targeted DNA double-stranded breaks (DSBs). SSNs such as zinc-finger nuclease (ZFN) and transcription activator-like effector nuclease (TALEN) were widely applied in genome editing in plants . However, in recent years, these SSNs have been overtaken by CRISPR (clustered regularly interspaced short palindromic repeats) systems with Cas9 or Cas12a (formerly Cpf1) nucleases that mediate DNA targeting through guide RNAs, which are easy to engineer [2–8]. CRISPR-Cas12a is an RNA-guided endonuclease that has provided new opportunities in genome editing through its distinct features from the commonly used CRISPR-Cas9 system. First, the PAM requirement for Cas12a is “TTTV” or “TTV,” which is advantageous for targeting promoters and other AT-rich sites in gene coding regions . Cas12a requires only a ~ 43-nt guide CRISPR RNA (crRNA) and processes pre-crRNAs into mature RNAs, an ability that endows Cas12a systems with a natural multiplexing ability [9–12]. Additionally, Cas12a creates 4–5 bp staggered overhangs which may potentially facilitate gene replacement. Finally, Cas12a, unlike other nucleases such as Cas9, is not toxic in some organisms such as Chladymonas , which expands the spectrums of organisms that can benefit from genome editing. So far, three Cas12a varieties from different bacteria have been utilized for genome editing: Francisella novicida (FnCas12a), Lachnospiraceae bacterium (LbCas12a), and Acidaminococcus sp. BV3L6 (AsCas12a), and all of them have been tested in plants [14–18]. Once a DSB is created by Cas12a or other type of endonucleases, it must be repaired through one of the two main repair pathways: non-homologous end joining (NHEJ) or homology-directed repair (HDR). NHEJ is the most commonly utilized pathway and often results in insertion/deletions (indels) that knock out targeted genes. Cas12a genome editing based on NHEJ has been demonstrated in a few plant species. In rice, editing was achieved at 12.1% mutation frequency using a small RNA promoter (OsU3) and a tRNA processing system to express crRNA . By using a full-length repeat-spacer-repeat sequence and allowing LbCas12a’s endogenous processing system to create mature crRNA, mutation frequencies up to 41.2% were achieved in rice . However, edited T0 plants were mostly heterozygous or chimeric and no homozygous plants were observed. We were able to achieve 100% mutation frequency in rice T0 plants using a double-ribozyme system with both Cas12a and crRNA under the control of the maize ubiquitin promoter (pZmUbi) . In protoplasts, LbCas12a had an efficiency of 15–25%, while AsCas12a ranged from 0.6 to 10% . The low editing efficiency of AsCas12a is consistent with previous results: one study could not detect any activity in rice T0 plants with AsCas12a and the other barely found AsCas12a-induced mutations in soybean protoplasts even when deep sequencing analysis was applied [15, 19]. Efficient maize genome editing up to 60% in T0 generation has also been achieved with LbCas12a . In addition to LbCas12a, efficient editing has been shown by FnCas12a in rice and tobacco [12, 14]. Recently, we showed LbCas12a and FnCas12a were very specific for DNA targeting in plants [17, 18]. Using whole-genome sequencing, we could not detect any off-target mutations when targeting three sites in rice by LbCas12a , further demonstrating its high specificity. In order to bolster Cas12a efficiency and expand its targeting scopes, two aspects were addressed respectively: crRNA design and PAM requirements. Because crRNAs for Cas12a are shorter than the single-guide RNAs for Cas9, undesired secondary structures noticeably decrease efficiency [22, 23] or even render the crRNA non-functional as we showed in maize . Online tools CINDEL and CRISPR-DT can aid in crRNA design [22, 23]. Originally, FnCas12a was believed to have a PAM requirement of “TTV” . However, this was questioned by two recent studies in human and rice cells [18, 24]. Lately, LbCas12a-RR and LbCas12a-RVR variants working at “CCCC,” “TYCV,” and “TATG” sites  were demonstrated in rice for expanded targeting scopes [18, 26]. Cas12a has genome editing applications beyond DSB generation; for example, Cas12a can recruit activators, repressors, or deaminases to the target site for either transcriptional regulation or base editing. We previously reported AsCas12a- and LbCas12a-based repressors that repressed miR159b in Arabidopsis to less than 10% of wild-type (WT) expression . Interestingly, although AsCas12a was less efficient than LbCas12a in creating mutations, as a repressor, it was more consistent than LbCas12a in binding the targeted promoter to repress expression. While no reports have been published in plants, Cas12a-based transcriptional activators and base editors were successfully demonstrated in human cells [27, 28]. Cas12a nucleases and their engineered variants have been shown to efficiently and specifically cleave and bind DNA when crRNAs and processing systems are well designed. However, the pace of adoption of Cas12a systems to a wide collection of plant species has been slow, suggesting possible barriers for Cas12a technologies. One major barrier could be temperature as it was recently shown to affect Cas12a editing efficiency in zebrafish . Interestingly, Cas9 editing was previously demonstrated to be impacted by temperature and higher temperatures helped achieve high editing efficiency in Arabidopsis and citrus . Given plant transformation and growth are typically carried out at ambient temperatures (e.g., 20 to 25 °C), we reasoned that the difficulty of applying Cas12a nucleases in plants could be due to the fact that they are more temperature sensitive than Cas9. In this study, we systematically investigated this topic. Our results not only demonstrated that different Cas12a nucleases have differential activities and sensitivities to temperature in different plant species, but also shed light on the mechanism of temperature sensitivity for Cas12a. To investigate temperature sensitivity of AsCas12a, FnCas12a, and LbCas12a, we targeted OsROC5 and OsDEP1 in rice protoplasts at 22 °C, 28 °C, 32 °C, and 37 °C. In our system, both Cas12a and the crRNA were expressed under the maize ubiquitin promoter (pZmUbi) and the crRNA was precisely processed by hammerhead (HH) and hepatitis delta virus (HDV) ribozymes [17, 18]. Two biological replicates were first assessed by restriction fragment length polymorphism (RFLP) analysis (Additional file 1: Figure S1) before being submitted for deep sequencing (Fig. 1). For both targets, FnCas12a and LbCas12a were less sensitive to temperatures than AsCas12a. At 22 °C, the mutation frequencies for AsCas12a at both target sites were about 7%, much lower than the rates of FnCas12a and LbCas12a (Fig. 1a, b). The mutation frequencies by AsCas12a, however, were doubled when the transfected protoplasts were incubated at 28 °C, 32 °C, or 37 °C. The improvement on editing efficiency at higher temperatures was also observed for FnCas12a and LbCas12a, but less prominent when compared to AsCas12a (Fig. 1a, b). As a control, we also tested a SpCas9 construct targeting OsPDS (Fig. 1c and Additional file 1: Figure S2). Mutation frequencies by SpCas9 at the target site were the same at 22 °C and 28 °C, and the frequency increased at 32 °C (Fig. 1c). Meanwhile, the rice protoplast transfection efficiencies using a DNA vector carrying a green fluorescent protein (GFP) gene were comparable across four temperatures (Additional file 1: Figure S3). The mutation frequencies in SpCas9 and some Cas12a samples decreased at 37 °C (Fig. 1), which was likely caused by heat-related cell abnormalities at this high temperature. The results suggest Cas12a nucleases, like SpCas9, are temperature sensitive in rice cells. A temperature of 28 °C or higher is required for optimal Cas12a activity, while a higher temperature (e.g., 32 °C) is required for optimal Cas9 activity. Notably, AsCas12a is the most temperature sensitive among the three Cas12a nucleases tested. As targeted mutations are combinational outcomes of the nuclease activity and NHEJ repair, it is important to determine whether NHEJ repair was affected by temperature. We decided to investigate and compare the NHEJ mutation profiles by Cas12a nucleases at different temperatures. Sequence analysis of targeted mutations at OsDEP1 and OsROC5 showed differences in deletion size and position among the three Cas12a nucleases (Fig. 2 and Additional file 1: Figure S4), suggesting the staggered DNA ends generated by AsCas12a, FnCas12a, and LbCas12a are slightly different from each other. For example, the predominant deletion sizes (> 10% among all deletions) were 6 bp, 8 bp, 10 bp, and 11 bp for AsCas12a; 7 bp, 8 bp, and 9 bp for FnCas12a; and 8 bp, 9 bp, and 10 bp for LbCas12a. The mutation profiles at the same target site with the same Cas12a nuclease, however, were strikingly similar across four temperatures (Fig. 2 and Additional file 1: Figure S4). Hence, this experiment revealed a different cleavage property of each of the three Cas12a nucleases. However, temperature did not influence NHEJ repair pathway choice (e.g., the use of canonical NHEJ pathway versus the microhomology-based alternative NHEJ pathway), which was further confirmed when we analyzed the NHEJ mutation profiles by Cas9 at different temperatures (Additional file 1: Figure S5). Despite previous attempts [15, 17, 19], AsCas12a has not been successfully applied for generating heritable mutations in plants. To determine whether AsCas12a can be effectively used for genome editing under high-temperature treatments, stable transgenic T0 rice lines targeting OsDEP1 and OsROC5 were generated by co-culturing with Agrobacterium at 25 °C, selecting at 32 °C, and regenerating shoots at 28 °C. The T0 plants were analyzed by RFLP-based genotyping (Additional file 1: Figure S6) and Sanger sequencing (Fig. 3). The editing frequencies in T0 lines at OsDEP1 and OsROC5 were 77.8% and 92.8%, respectively (Fig. 3a and Additional file 1: Figure S6). For OsDEP1, 61.9% mutants were biallelic, and for OsROC5, 46.2% mutants were biallelic. 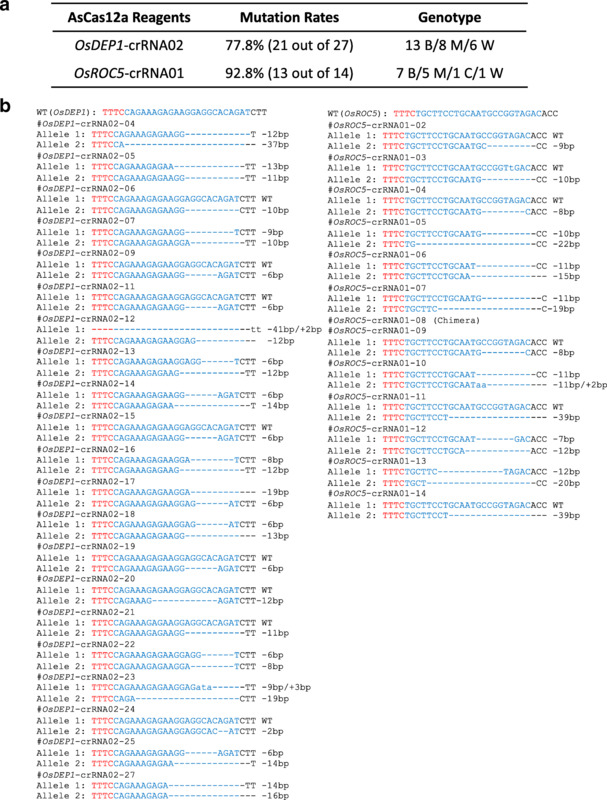 Nearly 100% mutations in these T0 lines were deletions (Fig. 3b), which was consistent with the deletion size analysis in protoplasts (Fig. 2 and Additional file 1: Figure S4). The data suggest that when a high-temperature regime is applied during rice tissue culture, AsCas12a can reliably generate targeted mutations at high frequencies. We next sought to generate heritable mutations in the dicot model plant, Arabidopsis, in which Cas12a-based mutagenesis has not been demonstrated. We decided to use a dual Pol II promoter for the LbCas12a system because it resulted in high mutation frequencies in rice  and its activity seems less sensitive to temperature (Fig. 1). The pZmUbi promoter used to express LbCas12a, and the crRNA here was also previously applied for Cas9 genome editing in Arabidopsis with high efficiency . We targeted GL2 (GLABRA 2) and TT4 (TRANSPARENT TESTA 4) genes with one crRNA for each gene. The WT Arabidopsis plants (Col) were transformed with two corresponding T-DNA constructs via the floral dip method. The Arabidopsis plants were grown at 22 °C, a temperature at which LbCas12a displayed a good editing activity in rice (Fig. 1a, b). T1 transgenic plants were screened by RFLP, as mutations induced by LbCas12 would likely abolish the restriction enzyme site of SalI at both GL2 and TT4 target sites. However, we could not identify a single LbCas12a T1 plant that seemed to carry targeted mutations at either site (data not shown). The surprising results prompted us to investigate whether LbCas12a requires a higher temperature to be active in Arabidopsis. To test this hypothesis, we decided to try 29 °C as a high temperature because Cas12a nucleases required a temperature of 28 °C or higher to reach optimal activity in rice (Fig. 1). We harvested seeds of T2 population from selected T1 lines. These T2 lines were grown on MS-hygromycin selection medium at 22 °C and 29 °C for 2 weeks, and then were used for DNA extraction followed by RFLP-based mutation analysis. For GL2, T2 line #8 showed mutations at 29 °C, but not at 22 °C (Fig. 4c). Further quantified data indicated a mutation frequency of 35% at 29 °C for T2 line #8 (Fig. 4b). Analysis of three additional GL2 T2 lines all revealed detectable mutation frequencies at 29 °C, but not at 22 °C (Fig. 4b). Similarly, while two examined T2 lines (#2 and #7) for TT4 showed mutation frequencies of about 14% and 15% at 29 °C, no mutation could be detected at 22 °C (Fig. 4c, d). We also tested a late treatment of transgenic plants at 29 °C (see the “Methods” section), which was less effective in inducing LbCas12a-mediated mutations at both target sites (Additional file 1: Figure S7). In addition, we compared LbCas12a and AsCas12a at editing the TT4 locus in protoplasts made from Arabidopsis rosette leaves. LbCas12a showed higher editing activity at 29 °C than at 22 °C (Additional file 1: Figure S8a). However, editing activity of AsCas12a was undetectable at this locus under both temperatures (Additional file 1: Figure S8b). We then developed a high-temperature treatment regime for GL2 and TT4 T2 plants with early treatment of 29 °C for about 4 weeks before moving the plants to 22 °C for recovery. T3 plants from these T2 parents were grown in a greenhouse at ~ 22 °C to demonstrate stable germline editing and evaluate mutation frequencies. Leaf tissues were collected from the three lines (GL2 #7-4, GL2 #7-7, and TT4 #9-7) for RFLP and Sanger sequencing (Fig. 5a, b). Thirty-three percent of the plants from GL2 #7-4, 21% of plants from GL2 #7-7, and 5.8% from TT4 #9-7 had targeted mutations (Fig. 5a). Among T3 lines from GL2 #7-4, the same mutation (a deletion of 5 bp) was found in all the homozygous and heterozygous plants, suggesting germline transmission from the parent (Fig. 5b). All homozygous GL2 #7-4 plants had a trichome-less (gl2 loss-of-function) phenotype (Fig. 5c). For GL2 #7-7 T3 plants, only GL2 #7-7-1 showed a loss-of-function phenotype. Sequencing analysis showed that the other homozygous or biallelic plants (e.g., GL2 #7-7-14 and GL2 #7-7-17) had the same allele of 3-bp deletion, suggesting the mutated protein, albeit missing one amino acid, is still functional. The LbCas12a reagent seems less efficient at the TT4 locus since only two heterozygous mutants were identified out of 34 TT4 #9-7 T3 lines (Fig. 5a, b). We followed two homozygous GL2 #7-4 lines to the T4 generation and found the mutations were germline transmitted (data not shown). Together, we demonstrated LbCas12a-mediated germline editing in Arabidopsis with a high-temperature treatment. Our data in rice and Arabidopsis collectively suggest a temperature around 28 °C could be an optimal and practical temperature for achieving high-efficiency plant genome editing by Cas12a nucleases. 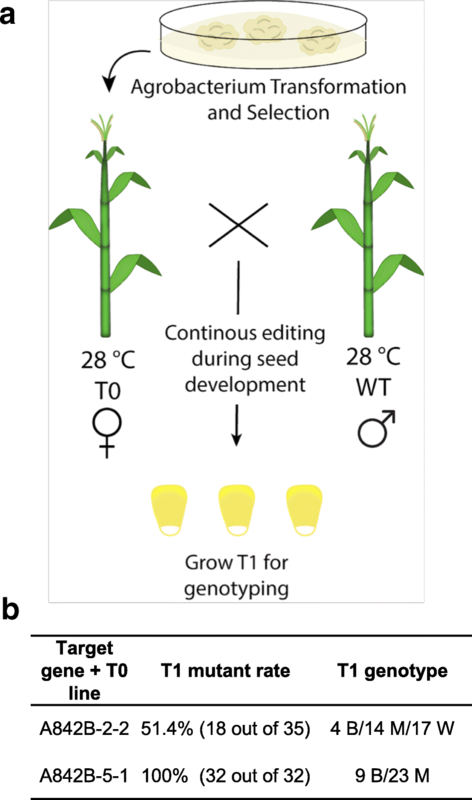 To validate whether this is widely applicable to other plant species, we further tested high-temperature regimes in maize, an important commodity crop in which we recently demonstrated genome editing with LbCas12a . We grew two independent T0 lines expressing LbCas12a and ZmGL2-crRNA1 (A842B-2-2 and A842B-5-1), along with the WT plants, in a greenhouse with a 16-h/8-h photoperiod and the temperature setting of 28 °C/21 °C (day/night). These T0 plants were crossed with WT B104 lines (the pollen donor) and kept in the same environment until maturity for harvesting T1 seeds (Fig. 6a). We genotyped T1 seedlings by Sanger sequencing (Fig. 6b). For A842B-2-2, 51.4% of T1 plants were mutated (18 out of 35). For A842B-5-1, 100% of T1 plants were mutated (32 out of 32), suggesting high mutagenesis frequencies. Biallelic mutants were obtained in T1 plants, and many new mutations were generated in the T1 generation (Fig. 6b and Additional file 1: Figure S9), indicating high activity of LbCas12a in maize at 28 °C. 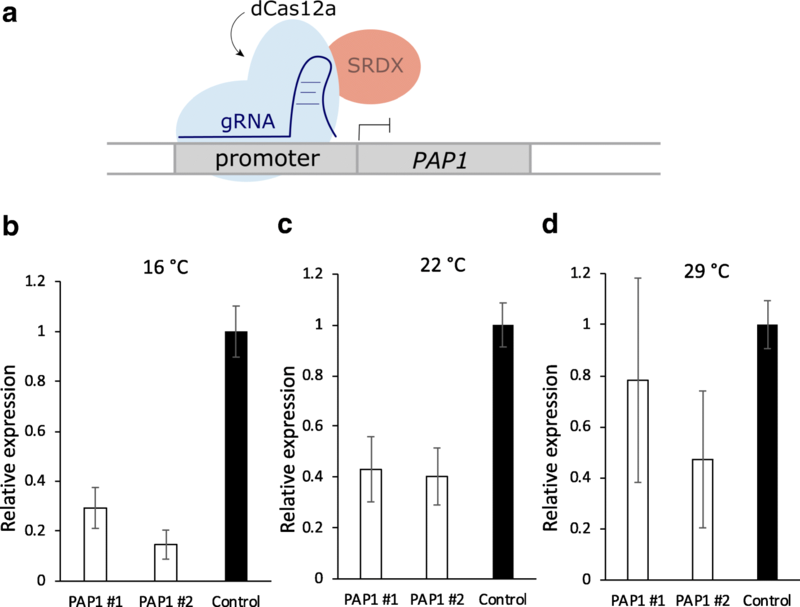 While the above-mentioned results clearly demonstrated activities of Cas12a nucleases are temperature sensitive, it is less clear which of the underlining mechanisms are affected. Before Cas12a can cleave DNA, it must scan the genome, find a PAM and crRNA complimentary sequence, unwind the DNA, and make conformational changes that activate nuclease activity [32, 33]. Temperature may affect any one, or all, of these steps. Although testing all these in vivo will be challenging, we reasoned that we could test whether Cas12a in planta binding to DNA is affected by temperature. Given the contrasting differences of LbCas12a editing activities in Arabidopsis at 22 °C and 29 °C, we decided to test this in Arabidopsis by using a dLbCas12a-SRDX repressor that we had previously developed . We constructed a dLbCas12a-SRDX vector to target the promoter of PAP1 (PRODUCTION OF ANTHOCYANIN PIGMENT 1) with a single crRNA (Fig. 7a). Successful transcriptional repression would indicate successful binding of deactivated LbCas12a (dLbCas12a) to the target DNA. We selected two independent T1 lines for obtaining T2 generation seeds. T2 plants were germinated in MS-hygromycin selection medium for a week and then transplanted to new MS medium for 1-week treatment at 16 °C, 22 °C, and 29 °C, before analysis for gene expression by quantitative real-time (qRT)-PCR. The highest levels of repression were seen at 16 °C, where the expression of PAP1 was reduced to 30% and 20% of WT expression in the two transgenic lines, respectively (Fig. 7b). At 22 °C, expression of PAP1 was reduced to 40% of the WT in both lines (Fig. 7c). At 29 °C, PAP1 was also repressed, but more variation was seen between the two lines (Fig. 7d). Unsurprisingly, a comparative analysis of PAP1 in control plants shows that expression was higher at 29 °C, likely as a response to heat stress (Additional file 1: Figure S10). This could explain some variation between the lines and larger error bars for the repression results at 29 °C. Because repression was accomplished at lower temperatures, these results suggest that unlike genome editing, binding of LbCas12a to the target DNA is not abolished at lower temperatures. Further analysis of dLbCas12a-SRDX expression in transgenic lines indicated that its mRNA level was not elevated at a higher temperature (e.g., 29 °C) (Additional file 1: Figure S11). Rather, PAP1 #2 line showed higher expression of dLb-cas12a-SRDX at 16 °C (Additional file 1: Figure S11), which is consistent with stronger transcriptional repression on the target gene (PAP1) observed in this line at 16 °C (Fig. 7b). In this study, we investigated temperature sensitivity of different Cas12a nucleases and applied high-temperature treatment for genome editing in plants. First, we found in rice cells AsCas12a is more sensitive to temperature than LbCas12a, and our results are consistent with the observation in zebrafish . By doing stable rice transformation at a higher temperature, we showed that AsCas12a can induce heritable mutations at frequencies of 77.8% and 92.8% at two target sites. Hence, we not only demonstrated the use of AsCas12a for generating mutated plants for the first time, but also presented an efficient AsCas12a rice genome editing system, with mutagenesis frequencies close to those that we previously established for LbCas12a  and FnCas12a . Interestingly, although we found mutation profiles for the three Cas12a nucleases were different from each other in rice cells, the mutation profiles for AsCas12a were much more different from those of FnCas12a and LbCas12a. While an in vitro DNA cleavage assay revealed AsCas12a, LbCas12a, and FnCas12a, all cleave approximately after the 18th base (relative to PAM) on the non-targeted strand and after the 23rd base on the targeted strand , genome-wide studies in human cells also suggested different mutation repair profiles of AsCas12a and LbCas12a [34, 35]. Further, both in vitro and in vivo data have suggested that AsCas12a has higher targeting specificity than LbCas12a [3, 34]. More recently, kinetic basis for high targeting specificity of AsCas12a was revealed . These previous studies highlighted the importance of developing AsCas12a-based genome editing systems, supporting the significance of our work on improving AsCas12a activity in plants. We hope our success with AsCas12a in rice will facilitate future research into applying and improving AsCas12a for genome editing in other plant species. We also observed temperature sensitivities for LbCas12a in Arabidopsis. While LbCas12a showed reasonable nuclease activities in rice protoplasts and detectable activity in Arabidopsis protoplasts at 22 °C, it barely worked in Arabidopsis cells of stable transgenic lines at the same temperature. This could be due to the procedures of delivering CRISPR-Cas12a reagents, in vitro cell culture for the transient protoplast assay and floral dip for Arabidopsis. Also, the length of Cas12a treatment and the tissue sources for evaluating mutagenesis are different among transient and stable transgenesis. It is possible that any of these factors had contributed to the drastic difference between rice and Arabidopsis on editing efficiencies we observed. It is likely that chromatin structure plays a role as it has been shown to impact genome editing. For example, the natural cycle of nucleosome breathing and ATP-driven chromatin remodelers are essential for Cas9 binding at target sites [37, 38], and the same can be true for Cas12a. Recent comparative studies have revealed distinct chromatin packing in rice and Arabidopsis [39, 40]. It will be interesting to investigate how chromatin states in different plant species impact Cas12a and other CRISPR-Cas systems on genome editing. Nevertheless, we were able to rescue LbCas12a activity at a higher temperature and demonstrated LbCas12a-based germline editing in Arabidopsis. By contrast, AsCas12a showed undetectable editing activity at the TT4 locus in Arabidopsis protoplasts, which is consistent with the general observation in rice where AsCas12a has lower activity than LbCas12a. Since the baseline genome editing efficiency in Arabidopsis is much lower than that in rice, more future improvement is required in order to establish an efficient genome editing system in Arabidopsis using AsCas12a. Since we did not test the effects of temperature change on AsCas12a in rice seedlings, it is possible that using high temperature at different stages (e.g., seedlings vs calli) may result in different effects. We also applied a high-temperature regime for achieving LbCas12a-based high-frequency genome editing in maize T1 lines. We showed that when transgenic maize lines expressing LbCas12a and crRNA were crossed to the WT plants, mutated T1 lines can be generated at a frequency as high as 100%, provided that the entire process of generating the T1 generation is done at a day time temperature of 28 °C. Many of the mutations discovered in the T1 lines are de novo generated new mutations. Our data were consistent with the recent report that new mutations could be generated in gametes or zygotes by Cas9 in maize . Although we crossed our LbCas12a lines to WT, it is conceivable that we can also cross these transgenic lines to other transformation-recalcitrant maize varieties to knock out genes in different maize genetic backgrounds, as was shown previously with Cas9 . Following our recent demonstration of LbCas12a in maize , the work here further streamlined an efficient LbCas12a system for targeted mutagenesis in maize. In addition, we showed that Cas9 is temperature sensitive in rice, which is consistent with the recent report that investigated this issue in Arabidopsis and citrus . Interestingly, Cas9 showed similar nuclease activities at 22 °C and 28 °C, and we started to see increased nuclease activity in rice protoplasts at 32 °C (Fig. 1c). Cas9 displayed optimal nuclease activity in human cells at 37 –39 °C , and a heat stress of 37 °C was applied for improving Cas9 editing in plants . In zebrafish, AsCas12a had poor activity at 28 °C and its activity was drastically improved by elevating the temperature to 34 °C . By contrast, we found Cas12a nucleases seem to reach optimal activities in plants at around 28–29 °C, which is more feasible given most plants grow in temperatures around 22–29 °C. For example, we have grown rice and maize constantly at 28 °C and have treated Arabidopsis at 29 °C for up to ~ 4 weeks continuously. However, lengthy and continuous treatment at 29 °C significantly impedes Arabidopsis growth. Further exploration of heat treatment regimens will probably result in more robust genome editing in plants. Hence, while Cas12a nucleases are temperature sensitive, it should not be a barrier that prevents adoption of them for genome editing in many other plant species. A question remains, however, as why Cas12a-based genome editing is temperature sensitive. With the analysis of NHEJ mutations by all three Cas12a nucleases across four different temperatures, we ruled out the possible involvement of DNA repair pathways in this difference. Opposite effects of high temperatures on the activities of ZFN and TALEN versus CRISPR-Cas9 were reported in mammalian cells , which also suggested the effects were unlikely due to DNA repair machinery. Using a dLbCas12a-SRDX repressor, we further demonstrated that the DNA binding property of LbCas12a at lower temperatures is as good as, if not better than, higher temperatures. This is consistent with our previous observation that the dAsCas12a-SRDX repressor could work robustly in mediating targeted transcriptional repression at room temperature in Arabidopsis . While DNA binding is not significantly affected under these temperatures, it is still possible that chromatin structure is affected by temperature in a way that impacts the necessary conformation change of the Cas12a/crRNA ribonucleoprotein complex that is required for activation of nuclease activity, as supported by the data in zebrafish . Our data collectively points to a working hypothesis that Cas12a nuclease activity is affected by temperature. Upon activation, Cas12a proteins also unleash single-stranded DNase activities [44, 45]. We predict such non-specific DNase activities are likely also temperature sensitive. Finally, given that we have narrowed down the main cause of temperature sensitivity to Cas12 nuclease activities, it will be highly valuable and should also be possible to engineer Cas12a variants that are more active at lower temperatures, similar to engineering Cas12a variants with altered PAM specificities , which we and others have recently demonstrated in plants [18, 26]. T-DNA vectors for CRISPR-Cas9 were constructed based on the protocols described previously . Briefly, forward and reverse oligos for OsPDS-gRNA03 (Additional file 1: Table S1) were phosphorylated, annealed, and ligated into pTX172 (Addgene #89259) at its BsaI sites. T-DNA vectors for CRISPR-Cas12a were constructed based on the protocols described previously . Forward and reverse oligos for OsROC5-crRNA01, OsDEP1-crRNA02, AtGL2-crRNA1, and AtTT4-crRNA1 (Additional file 1: Table S1) were phosphorylated, annealed, and cloned into the Esp3I sites of pYPQ141-ZmUbi-RZ-As (Addgene #86196), pYPQ141-ZmUbi-RZ-Lb (Addgene #86197), and pYPQ141-ZmUbi-RZ-Fn (Addgene #108864). The resulting crRNA expression vectors were mixed with pYPQ203 (destination vector, Addgene #86207) and with pYPQ220 (AsCas12a, Addgene #86208), pYPQ230 (LbCas12a, Addgene #86210), and pYPQ239 (FnCas12a, Addgene #108859), to generate the final T-DNA binary vectors using multi-site LR reactions (1-5-2) [47, 48]. The LbCas12a-ZmGL2 T-DNA vector (A842B) for maize transformation was described previously . The T-DNA vector for transcriptional repression in Arabidopsis was constructed similarly. The protospacer of AtPAP1-crRNA1 (Additional file 1: Table S1) was cloned into pYPQ141-ZmUbi-RZ-Lb at Esp3I sites in the form of phosphorylated and annealed oligos. Then, a multi-site LR reaction using pYPQ141-ZmUbi-RZ-Lb-AtPAP1-crRNA1, pYPQ233 (dLbCas12a-SRDX, Addgene #86211), and pYPQ202 (Addgene #86198) was conducted to generate the final T-DNA vector. The Japonica rice cultivar Nipponbare was used in this study. Polyethylene glycol (PEG)-mediated transfection of rice mesophyll protoplasts with T-DNA vectors was carried out according to our previously published protocol [46, 49]. After transfection, rice protoplasts were divided and incubated for 2 days at four temperatures, 22 °C, 28 °C, 32 °C, and 37 °C. A DNA construct carrying GFP marker gene was used as a control to determine the transfection efficiencies. Cells with green fluorescence were counted 2 days after the transfection. Rice stable transformation was conducted as published previously . Plants were grown in a growth chamber at 25 °C for co-culture, 32 °C for selection, and 28 °C for shoot generation. Genomic DNA was extracted from transfected rice protoplasts or leaves of transgenic lines using the cetyl trimethylammonium bromide (CTAB) method . The genomic region flanking target sites were PCR amplified with primers DEP1-F 5′-TCACCGATTCTTTCCATGCG-3′, DEP1-R 5′-GCCACAATCGGGTTTGCATT-3′, ROC5-F 5′ CTTATGTTCCGTTCCAATCCT-3′, ROC5-R 5′ CCTACACTTCACATTTCCACCT-3′ and PDS-F 5′ GCTCACACTGTTTTGTCGTCC-3′, and PDS-R 5′ ATCATATGCAGCGCTGGAGT-3′. DEP1 PCR products were digested with BglII and ROC5 PCR products were digested with NlaIII for RFLP analysis. PDS PCR products were digested with AseI. The PCR products were digested by their corresponding restriction enzymes overnight and then analyzed by agarose gel electrophoresis. Mutations in T0 plants were further identified by Sanger sequencing of the PCR products. High-throughput sequencing analysis was conducted for transfected rice protoplast samples as published previously [46, 51]. The genomic region flanking target sites were PCR amplified using barcoded primers. Purified DNA samples were quantified by Qubit 2.0 Fluorometer (Life Technologies) and were sequenced using Illumina HiSeq 2500 platform. Data processing was carried out using CRISPRMatch . Arabidopsis WT plants (Col) were transformed by the floral dip method . Seeds for T1, T2, and T3 generations were sterilized using 50% bleach and 0.05% Tween, vernalized at 4 °C for 3 days, then plated to MS-hygromycin plates. After a week, transgenic plants were transferred to MS clean plates for a week of recovery before soil transplantation. To test a variety of T2 lines, five individual plants were sacrificed after 2 weeks of heat treatment at 29 °C on MS plates. Leaf tissue was used for DNA extraction using a modified CTAB method . The rest of the plants were transferred to soil and kept at 29 °C for a total of 29 days before recovery at 22 °C. A second batch of plants was heat treated to test an alternative method of late treatment at 29 °C. For this, 6 days after plating, the plants were kept at 29 °C for 8 days. After 24 days of recovery at 22 °C, plants were kept at 29 °C again for 14 days. For mutation analysis, a ~ 677 bp fragment covering the GL2 target site was amplified using the primers GL1-F1 5′-GATGGCTGCCAATGCTGTAGCTGG-3′ and GL2-R1 5′-CGTCAACTACTCTTCTGCCCAGG-3′, and a ~ 400-bp fragment covering the TT4 target site was amplified using the primers TT4-F2 5′-AGGCATCTTGGCTATTGGCACTG-3′ and TT4-gR3-top 5′-gattGGGCTGGCCCCACTCCTTGA-3′. GL2 and TT4 PCR products underwent RFLP analysis through direct digestion with restriction enzyme SalI and analysis on 1.5% and 2% agarose gels, respectively. The mutation percentages for each plant were estimated from RFLP gels with Image Lab (BioRad). PCR products were cleaned using Exonuclease I and Antarctic Phosphatase and sent for Sanger sequencing. Results were aligned in Snapgene and decoded with CRISP-ID (GSL Biotech LLC) . Arabidopsis protoplast isolation and transformation were based on our previous study [49, 55]. Arabidopsis Col-0 plants were grown under 12-h light/12-h dark photoperiod at 22–25 °C for 4 weeks. About 10–20 fresh leaves were cut into leaf strips by razor blades at 0.5–1 mm in width. Leaf strips were quickly transferred into 8–10 ml enzyme solution (1.0–1.5% Cellulase R10, 0.25% Macerozyme R10, 0.4 M Mannitol, 20 mM MES, 20 mM KCl, 10 mM CaCl2, 0.1% BSA, and pH 5.8), followed by vacuum infiltration for 30 min. The leaf strips were digested by shaking at 30 rpm for 1–4 h at 25 °C in the dark. The digested products were filtered with 70-μm nylon mesh into 50-ml tube with 10 ml W5 buffer. The protoplasts were collected at 200×g for 2 min. Then, they were resuspended with 10 ml W5 buffer twice and were centrifuge at 100×g for 1 min at RT. The cells were suspended in MMG buffer (0.4 M Mannitol, 4 mM MES, 15 mM MgCl2, pH 5.8) for 1 × 105 cells/ml. Two hundred microliter protoplasts were mixed with 30 μl plasmid (30 μg) and 230 μl PEG buffer (40% w/v PEG4000, 0.2 M mannitol, and 0.1 M CaCl2) for incubation at 23 °C for 30 min. After adding 900 μl W5 buffer to stop transformation, the protoplasts were centrifugal at 200×g for 5 min and resuspended in 1 ml WI buffer (0.5 M mannitol, 20 mM KCl, and 4 mM MES at pH 5.7), and then transferred into two six-well culture plates in equal amount and incubated at 22 °C and 29 °C. After incubation for 24 h, the protoplasts were collected for DNA extraction and further analysis. Transgenic maize T1 seeds originated from two maternal T0 lines carrying a LbCas12a construct and on-target mutations in the target gene GL2 (A842B-2-2 and A842B-5-1) . These maternal T0 lines had been crossed with wild-type B104 pollen donors. The T0 lines were grown in a greenhouse with a 16-h/8-h photoperiod, and the temperature setting of 28 °C/21 °C (day/night). For each T0 line, 20 T1 seeds were sown on a tray containing Metro-Mix 900 potting mix (Sun-Gro Horticulture, Agawam, MA). Leaf tissues, first and second leaves, were collected from each T1 plant and pooled for genomic DNA isolation. The presence of T-DNA was confirmed by PCR using the primers LbCas12a-F 5′-AATGGAACGCGGAGTATGAC-3′ and LbCas12a-R 5′-ACATGTCGCCCTTCTTGAAC-3′ . The genotyping of the T1 plants were performed by PCR and sequencing using the primers Zm-gl2-F2 5′-CACAGCCTTGCAATCAATTC-3′, Zm-gl2-R2 5′-GCTGACGTGGAAGGAGTAGC-3′, and ZmGl2-exon2-F1 5′-ACACCGTGTCTTCGTCAAAA-3′ . About 1 kb fragment flanking, the LbCas12a target site was amplified using the oligonucleotides Zm-gl2-F2 and Zm-gl2-R2, and single-band amplification was confirmed by 1% agarose gel electrophoresis. PCR products were cleaned up by ExoSAP-IT kit (ThermoFisher Scientific) according to the manufacturer’s instruction. The oligonucleotide ZmGl2-exon2-F1 was used for Sanger sequencing, and the resulting trace files were analyzed by the Tracking of Indels by Decomposition (TIDE)  and DSDecode . Arabidopsis dLbCas12a-PAP1 T2 plants were grown on MS media with hygromycin at 22 °C for a week. They were then transferred to MS medium without hygromycin, allowed to recover at 22 °C for 2 days, and then grown at 16 °C, 22 °C, and 29 °C for a week. Arabidopsis leaf tissue was collected from these T2 seedlings. The qRT-PCR analysis was carried out following previously described protocols  with minor modifications. GUS transformed plants, also expressing a hygromycin resistance gene, were used as controls. Total RNA was extracted using TRIzol™ Reagent (Invitrogen) following the manufacturer’s instructions with the exception that samples were extracted twice using chloroform and washed twice by 75% ethanol. RNA was treated with DNase I (New England BioLabs) to remove DNA contamination. Complementary DNA (cDNA) was synthesized using SuperScript III First-Strand Synthesis System (Invitrogen) with Oligo dT. The qRT-PCR was set up using Applied Biosystems SYBR Green Master Mix (Invitrogen) and ran on the CFX96 Touch™ Real-Time PCR Detection System. The following primers were used for the transgenic plant samples: PAP1-F 5′-AGTATGGAGAAGGCAAATGGC-3′ and PAP1-R 5′-CACCTATTCCCTAGAAGCCTATG-3′, LbCas12a-RT-F1 5′-TTCGTTCAACGGATTCACAA-3′, and LbCas12a-RT-R1 5′-GCTTGTCAAAAATTGCGTCA-3′. Elongation factor 1 α (EF1α) was used as the internal control and amplified with the following primers: EF-1α-F 5′-TGAGCACGCTCTTCTTGCTTTCA-3′ and EF-1α-R 5′-GGTGGTGGCATCCATCTTGTTACA-3′. The average of three technical replicates was used for data analysis of each biological replicate. Relative expression to controls was calculated using the comparative threshold cycle method. Aimee A. Malzahn and Xu Tang contributed equally to this work. T0 transgenic maize lines were produced by Iowa State University Plant Transformation Facility. This work was supported by Syngenta, the National Science Foundation (IOS-1758745), Foundation for Food and Agriculture Research (593603), and startup funds provided by University of Maryland to YQ. This work was also supported by National Science Foundation of China (31771486) and the Sichuan Youth Science and Technology Foundation (2017JQ0005) and the Science Strength Promotion Program of UESTC to YZ, by the National Transgenic Major Project (2018ZX08020-003) and the Open Foundation of Jiangsu Key Laboratory of Crop Genomics and Molecular Breeding (PL201801) to YZ, and TZ, the Jiangsu Specially-Appointed Professor and the Priority Academic Program Development of Jiangsu Higher Education Institutions (PAPD) to TZ, and by the BRAG grant (2016–06247) to KW. The raw data of deep sequencing have been deposited to the Genome Sequence Archive in Beijing Institute of Genomics (BIG) under the accession number PRJCA000992 (http://bigd.big.ac.cn/bioproject/browse/PRJCA000992) and the Sequence Read Archive in National Center for Biotechnology Information (NCBI) under the accession number SRP158345 (https://www.ncbi.nlm.nih.gov/sra/SRP158345). Raw data for Figs. 1, 2, 4, 7 and Additional file 1: Figure S3, S4, S5, S8, S10, S11 can be found in ‘Additional file 2: Raw data’. YQ conceived the project. YQ, Yong Z, KW, AM, XT, and KL designed the experiments. AM, XT, KL, QR, SS, Yingxiao Z, HC, MK, XZ, KD, and VS conducted the experiments. AM, XT, KL, SS, HC, YB, TZ, KW, Yong Z, and YQ analyzed the data. AM, Yong Z, and YQ wrote the manuscript draft. All authors participated in the discussion and revision of the manuscript. All authors read and approved the final manuscript. Voytas DF. Plant genome engineering with sequence-specific nucleases. Annu Rev Plant Biol. 2013. https://doi.org/10.1146/annurev-arplant-042811-105552. Jinek M, Chylinski K, Fonfara I, Hauer M, Doudna JA, Charpentier E. A programmable dual-RNA-guided DNA endonuclease in adaptive bacterial immunity. Science. 2012. https://doi.org/10.1126/science.1225829. Zetsche B, Gootenberg JS, Abudayyeh OO, Slaymaker IM, Makarova KS, Essletzbichler P, et al. Cpf1 is a single RNA-guided endonuclease of a class 2 CRISPR-Cas system. Cell. 2015. https://doi.org/10.1016/j.cell.2015.09.038. Ma X, Zhu Q, Chen Y, Liu Y-G. CRISPR/Cas9 platforms for genome editing in plants: developments and applications. Mol Plant. 2016. https://doi.org/10.1016/j.molp.2016.04.009. Malzahn A, Lowder L, Qi Y. Plant genome editing with TALEN and CRISPR. Cell Biosci. 2017. https://doi.org/10.1186/s13578-017-0148-4. Murovec J, Pirc Ž, Yang B. New variants of CRISPR RNA-guided genome editing enzymes. Plant Biotechnol J. 2017. https://doi.org/10.1111/pbi.12736. Yin K, Gao C, Qiu J-L. Progress and prospects in plant genome editing. Nature Plants. 2017. https://doi.org/10.1038/nplants.2017.107. Schindele P, Wolter F, Puchta H. Transforming plant biology and breeding with CRISPR/Cas9, Cas12 and Cas13. FEBS Lett. 2018. https://doi.org/10.1002/1873-3468.13073. Fonfara I, Richter H, Bratovič M, Le Rhun A, Charpentier E. The CRISPR-associated DNA-cleaving enzyme Cpf1 also processes precursor CRISPR RNA. Nature. 2016. https://doi.org/10.1038/nature17945. Zetsche B, Heidenreich M, Mohanraju P, Fedorova I, Kneppers J, DeGennaro EM, et al. Multiplex gene editing by CRISPR-Cpf1 through autonomous processing of a single crRNA array. Nat Biotechnol. 2017. https://doi.org/10.1038/nbt.3737. Swarts DC, van der Oost J, Jinek M. Structural basis for guide RNA processing and seed-dependent DNA targeting by CRISPR-Cas12a. Mol Cell. 2017. https://doi.org/10.1016/j.molcel.2017.03.016. Wang M, Mao Y, Lu Y, Tao X, Zhu J-K. Multiplex gene editing in rice using the CRISPR-Cpf1 system. Mol Plant. 2017. https://doi.org/10.1016/j.molp.2017.03.001. Ferenczi A, Pyott DE, Xipnitou A, Molnar A. Efficient targeted DNA editing and replacement in Chlamydomonas reinhardtii using Cpf1 ribonucleoproteins and single-stranded DNA. PNAS. 2017. https://doi.org/10.1073/pnas.1710597114. Endo A, Masafumi M, Kaya H, Toki S. Efficient targeted mutagenesis of rice and tobacco genomes using Cpf1 from Francisella novicida. Sci Rep. 2016. https://doi.org/10.1038/srep38169. Hu X, Wang C, Liu Q, Fu Y, Wang K. Targeted mutagenesis in rice using CRISPR-Cpf1 system. J Genet Genomics. 2017. https://doi.org/10.1016/j.jgg.2016.12.001. Xu R, Qin R, Li H, Li D, Li L, Wei P, et al. Generation of targeted mutant rice using a CRISPR-Cpf1 system. Plant Biotechnol J. 2017. https://doi.org/10.1111/pbi.12669. Tang X, Lowder LG, Zhang T, Malzahn AA, Zheng X, Voytas DF, et al. A CRISPR–Cpf1 system for efficient genome editing and transcriptional repression in plants. Nature Plants. 2017. https://doi.org/10.1038/nplants.2017.103. Zhong Z, Zhang Y, You Q, Tang X, Ren Q, Liu S, et al. Plant genome editing using FnCpf1 and LbCpf1 nucleases at redefined and altered PAM sites. Mol Plant. 2018. https://doi.org/10.1016/j.molp.2018.03.008. Kim H, Kim S-T, Ryu J, Kang B-C, Kim J-S, Kim S-G. CRISPR/Cpf1-mediated DNA-free plant genome editing. Nat Commun. 2017. https://doi.org/10.1038/ncomms14406. Lee K, Zhang Y, Kleinstiver BP, Guo JA, Aryee MJ, Miller J, et al. Activities and specificities of CRISPR-Cas9 and Cas12a nucleases for targeted mutagenesis in maize. Plant Biotechnol J. 2018. https://doi.org/10.1111/pbi.12982. Tang X, Liu G, Zhou J, Ren Q, You Q, Tain L, et al. A large-scale whole-genome sequencing analysis reveals highly specific genome editing by both Cas9 and Cpf1(Cas12a) nucleases in rice. Genome Biol. 2018. https://doi.org/10.1186/s13059-018-1458-5. Kim HK, Song M, Lee J, Menon AV, Jung S, Kang Y-M, et al. In vivo high-throughput profiling of CRISPR–Cpf1 activity. Nat Methods. 2017. https://doi.org/10.1038/nmeth.4104. Tu M, Lin L, Cheng Y, He X, Sun H, Xie H, et al. A ‘new lease of life’: FnCpf1 possesses DNA cleavage activity for genome editing in human cells. Nucleic Acids Res. 2017. https://doi.org/10.1093/nar/gkx783. Gao L, Cox DBT, Yan WX, Manteiga JC, Schneider MW, Yamano T, et al. Engineered Cpf1 variants with altered PAM specificities. Nat Biotechnol. 2017. https://doi.org/10.1038/nbt.3900. Li S, Zhang X, Wang W, Guo X, Wu Z, Du W, et al. Expanding the scope of CRISPR/Cpf1-mediated genome editing in rice. Mol Plant. 2018. https://doi.org/10.1016/j.molp.2018.03.009. Tak YE, Kleinstiver BP, Nuñez JK, Hsu JY, Horng JE, Gong J, et al. Inducible and multiplex gene regulation using CRISPR–Cpf1-based transcription factors. Nat Methods. 2017. https://doi.org/10.1038/nmeth.4483. Li C, Zong Y, Wang Y, Jin S, Zhang D, Song Q, et al. Expanded base editing in rice and wheat using a Cas9-adenosine deaminase fusion. Genome Biol. 2018. https://doi.org/10.1186/s13059-018-1443-z. Moreno-Mateos MA, Fernandez JP, Rouet R, Vejnar CE, Lane MA, Mis E, et al. CRISPR-Cpf1 mediates efficient homology-directed repair and temperature-controlled genome editing. Nat Commun. 2017. https://doi.org/10.1038/s41467-017-01836-2. LeBlanc C, Zhang F, Mendez J, Lozano Y, Chatpar K, Irish VF, et al. Increased efficiency of targeted mutagenesis by CRISPR/Cas9 in plants using heat stress. Plant J. 2018. https://doi.org/10.1111/tpj.13782. Ma X, Zhang Q, Zhu Q, Liu W, Chen Y, Qiu R, et al. A robust CRISPR/Cas9 system for convenient, high-efficiency multiplex genome editing in monocot and dicot plants. Mol Plant. 2015. https://doi.org/10.1016/j.molp.2015.04.007. Dong D, Ren K, Qiu X, Zheng J, Guo M, Liu H, et al. The crystal structure of Cpf1 in complex with CRISPR RNA. Nature. 2016. https://doi.org/10.1038/nature17944. Yamano T, Nishimasu H, Zetsche B, Hirano H, Slaymaker IM, Li Y, et al. Crystal structure of Cpf1 in complex with guide RNA and target DNA. Cell. 2016. https://doi.org/10.1016/j.cell.2016.04.003. Kleinstiver BP, Tsai SQ, Prew MS, Nguyen NT, Welch MM, Lopez JM, et al. Genome-wide specificities of CRISPR-Cas Cpf1 nucleases in human cells. Nat Biotechnol. 2016. https://doi.org/10.1038/nbt.3620. Kim D, Kim J, Hur JK, Been KW, Yoon S-H, Kim J-S. Genome-wide analysis reveals specificities of Cpf1 endonucleases in human cells. Nat Biotechnol. 2016. https://doi.org/10.1038/nbt.3609. Strohkendl I, Saifuddin FA, Rybarski JR, Finkelstein IJ, Russell R. Kinetic basis for DNA target specificity of CRISPR-Cas12a. Mol Cell. 2018. https://doi.org/10.1016/j.molcel.2018.06.043. Isaac RS, Jiang F, Doudna JA, Lim WA, Narlikar GJ, Almeida R. Nucleosome breathing and remodeling constrain CRISPR-Cas9 function. eLife Sciences. 2016. https://doi.org/10.7554/eLife.13450. Gong S, Yu HH, Johnson KA, Taylor DW. DNA unwinding is the primary determinant of CRISPR-Cas9 activity. Cell Rep. 2018. https://doi.org/10.1016/j.celrep.2017.12.041. Liu C, Wang C, Wang G, Becker C, Zaidam M, Weigel D. Genome-wide analysis of chromatin packing in Arabidopsis thaliana at single-gene resolution. Genome Res. 2016. https://doi.org/10.1101/gr.204032.116. Liu C, Cheng Y-J, Wang J-W, Weigel D. Prominent topologically associated domains differentiate global chromatin packing in rice from Arabidopsis. Nat Plants. 2017. https://doi.org/10.1038/s41477-017-0005-9. Feng C, Su H, Bai H, Wang R, Liu Y, Guo X, et al. High-efficiency genome editing using a dmc1 promoter-controlled CRISPR/Cas9 system in maize. Plant Biotechnol J. 2018. https://doi.org/10.1111/pbi.12920. Li C, Liu C, Qi X, Wu Y, Fei X, Mao L, et al. RNA-guided Cas9 as an in vivo desired-target mutator in maize. Plant Biotechnol J. 2017. https://doi.org/10.1111/pbi.12739. Xiang G, Zhang X, An C, Cheng C, Wang H. Temperature effect on CRISPR-Cas9 mediated genome editing. J Genet Genomics. 2017. https://doi.org/10.1016/j.jgg.2017.03.004. Chen JS, Ma E, Harrington LB, Costa MD, Tian X, Palefsky JM, et al. CRISPR-Cas12a target binding unleashes indiscriminate single-stranded DNase activity. Science. 2018. https://doi.org/10.1126/science.aar6245. Gootenberg JS, Abudayyeh OO, Kellner MJ, Joung J, Collins JJ, Zhang F. Multiplexed and portable nucleic acid detection platform with Cas13, Cas12a, and Csm6. Science. 2018. https://doi.org/10.1126/science.aaq0179. Tang X, Zheng X, Qi Y, Zhang D, Cheng Y, Tang A, et al. A single transcript CRISPR-Cas9 system for efficient genome editing in plants. Mol Plant. 2016. https://doi.org/10.1016/j.molp.2016.05.001. Lowder LG, Zhang D, Baltes NJ, Paul JW, Tang X, Zheng X, et al. A CRISPR/Cas9 toolbox for multiplexed plant genome editing and transcriptional regulation. Plant Physiol. 2015. https://doi.org/10.1104/pp.15.00636. Zhang Y, Zhang F, Li X, Baller JA, Qi Y, Starker CG, et al. Transcription activator-like effector nucleases enable efficient plant genome engineering. Plant Physiol. 2013. https://doi.org/10.1104/pp.112.205179. Zhang Q, Xing H-L, Wang Z-P, Zhang H-Y, Yang F, Wang X-C, et al. 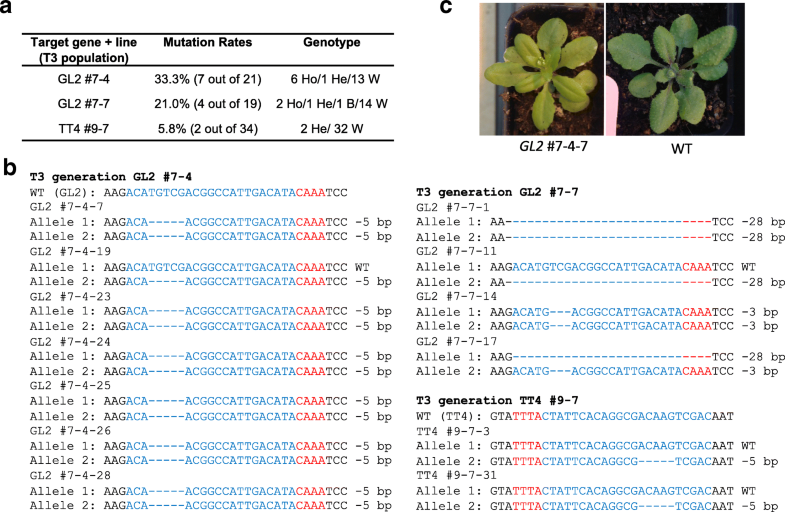 Potential high-frequency off-target mutagenesis induced by CRISPR/Cas9 in Arabidopsis and its prevention. Plant Mol Biol. 2018. https://doi.org/10.1007/s11103-018-0709-x. You Q, Zhong Z, Ren Q, Hassan F, Zhang Y, Zhang T. CRISPRMatch: An automatic calculation and visualization tool for high-throughput CRISPR genome-editing data analysis. Int J Biol Sci. 2018. https://doi.org/10.7150/ijbs.24581. Clough SJ, Bent AF. Floral dip: a simplified method for agrobacterium-mediated transformation of Arabidopsis thaliana: floral dip transformation of Arabidopsis. Plant J. 1998. https://doi.org/10.1046/j.1365-313x.1998.00343.x. Dehairs J, Talebi A, Cherifi Y, Swinnen JV. CRISP-ID: decoding CRISPR mediated indels by sanger sequencing. Sci Rep. 2016. https://doi.org/10.1038/srep28973. Qi Y, Zhang Y, Zhang F, Baller JA, Cleland SC, Ryu Y, Starker CG, Voytas DF. Increasing frequencies of site-specific mutagenesis and gene targeting in Arabidopsis by manipulating DNA repair pathways. Genome Res. 2013. https://doi.org/10.1101/gr.145557.112. Brinkman EK, Chen T, Amendola M, van Steensel B. Easy quantitative assessment of genome editing by sequence trace decomposition. Nucleic Acids Res. 2014. https://doi.org/10.1093/nar/gku936. Liu W, Xie X, Ma X, Li J, Chen J, Liu Y-G. DSDecode: a web-based tool for decoding of sequencing chromatograms for genotyping of targeted mutations. Mol Plant. 2015. https://doi.org/10.1016/j.molp.2015.05.009.